One High School Student with Perfect Attendance Will Win a 2017 Chevy Sonic! One lucky Santa Ana Unified School District high school student, who has had perfect attendance all year long, will be the winner of a brand new car as part of the Perfect Attendance Car Giveaway promotion courtesy of Bruce Hamlin, Owner of Guaranty Chevrolet, located at 711 East 17th Street in Santa Ana. 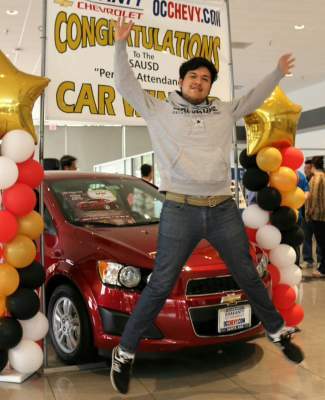 When Fernando Castaneda, an 11th grader at Santa Ana High School, woke up early on Saturday, June 6, 2015, to participate in the Perfect Attendance Car Giveaway, he thought it was a slim chance that he would actually be the winner of a brand new 2015 Chevy Sonic, courtesy of Bruce Hamlin, Owner of Guaranty Chevrolet. 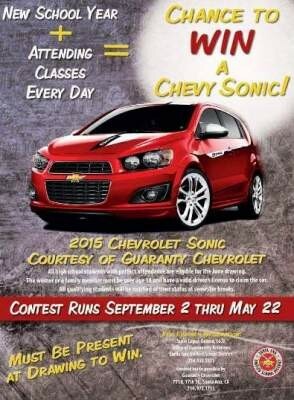 One High School Student with Perfect Attendance Will Win a 2015 Chevy Sonic! 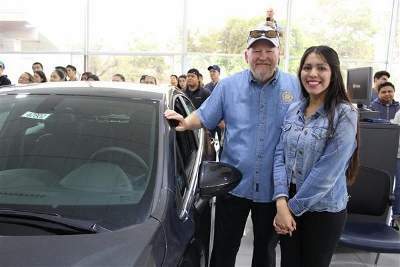 Santa Ana High School 12th Grade Student Nicandra Lopez won a new 2014 Chevy Sonic, courtesy of Guaranty Chevrolet, this past Saturday at the SAUSD’s Perfect Attendance Car Giveaway event. One High School Student with Perfect Attendance Will Win a 2014 Chevy Sonic! One High School Student with Perfect Attendance Will Win a 2013 Chevy Spark! 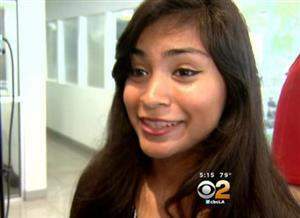 Middle College High Sophomore Wins Perfect Attendance Contest! 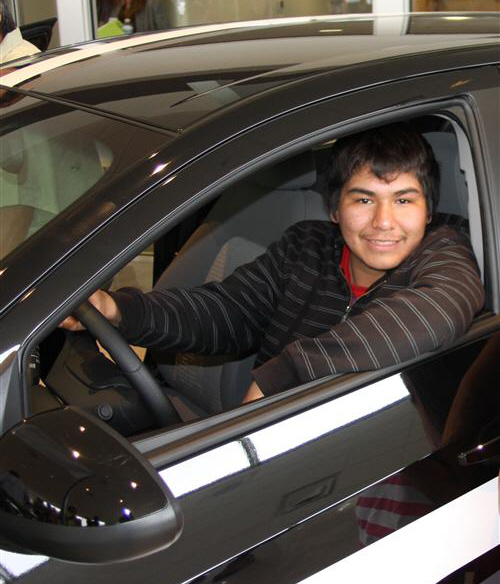 Middle College High Senior Wins a New Car! 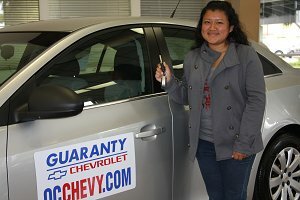 SANTA ANA, CA – Cathy Martinez, a senior from Middle College High School, is the lucky winner of a 2011 Chevy Cruze courtesy of Guaranty Chevrolet in Santa Ana. Martinez’s name was drawn from among more than 430 eligible students in the year-long perfect attendance incentive contest for high school students. 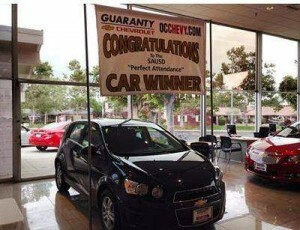 The winning name was drawn on Saturday, June 11 at the Guaranty Chevrolet dealership amid a crowd of school officials, principals, educators, parents, students and dealership personnel. Martinez, who this year earned a concurrent AA degree from Santa Ana College along with her high school diploma, will head off to UC Riverside in the fall. She is the second student from Middle College High to win the grand prize in the contest. This year, Guaranty Chevrolet upgraded the giveaway from an Aveo to a Cruze, a model which debuted this year. The car is valued at $20,000 and will be Martinez’s primary mode of transportation to UC Riverside. Guaranty Chevrolet has donated a brand new car to Santa Ana Unified School District for the fifth consecutive year as an incentive to keep high school students’ attendance on track. Since the program’s inception, perfect attendance has incrementally increased every year. The program encourages students to attend school on time, every day for every period. Learn more about the school district at http://www.sausd.us/.